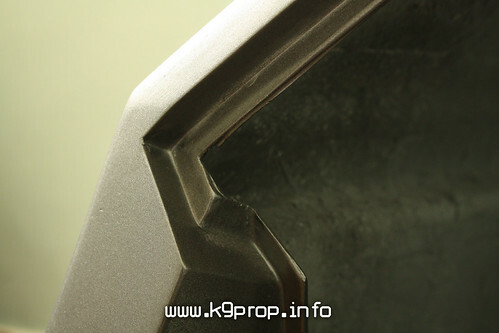 K9's body is a one piece GRP moulding with separate side panel (also GRP). The control panel on top and the VDU bezel are moulded separately in GRP and bonded into the main body. Inside the body there is an inset piece of plywood making a floor which allows easy fixing of additional internal components. 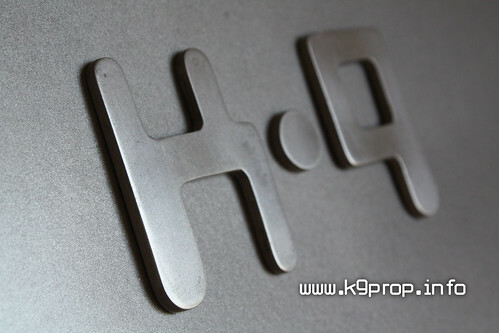 K9's Head is a 2 piece GRP Moulding and can be opened for access in the same way as the BBC prop. 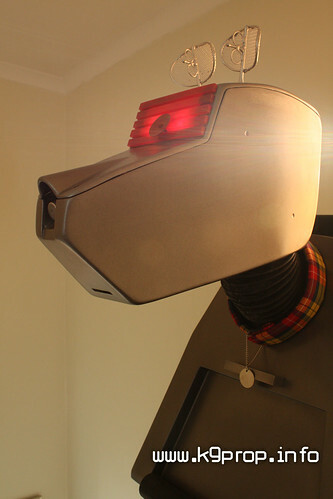 My K9 is currently a static prop (but was made with motorization in mind) and is illuminated. 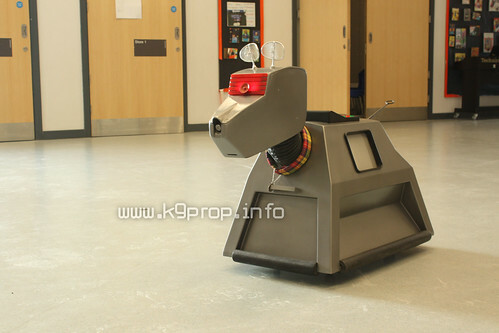 In my opinion, this prop looks good enough for exhibition (much better than some K9's I've paid to see in the past!) 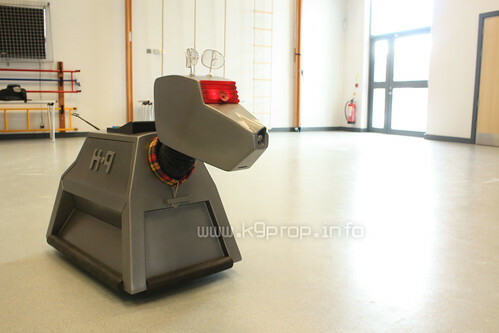 I welcome viewings and inspections of K9 for prospective buyers. The GRP side panel sits neatly in place and is easily removed by swinging the bottom of the panel outwards and then down. It stays in place without any catches, it simply sits snuggly in the rebates and the angles of the panel keep the bottom in place whereas two metal pegs keep the top edge in check. 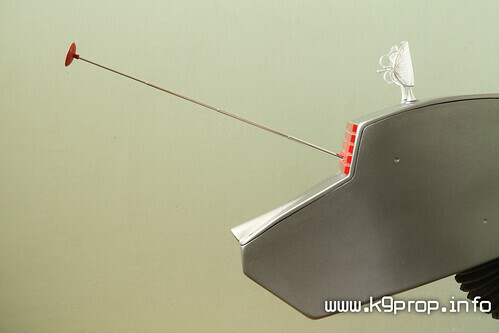 K9's eye panel is made from translucent cast acrylic and is lit up with two standard flash light bulbs inside the head. Battery power and switching is situated within the body. 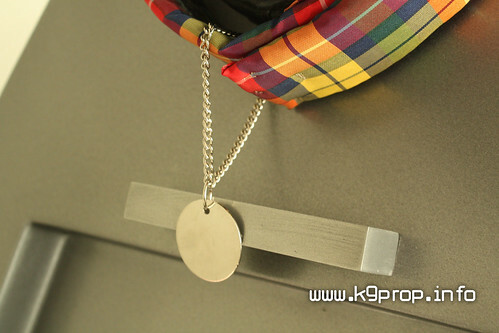 K9's collar is made from a screen correct tartan, he sports a blank name tag as per the original BBC prop. 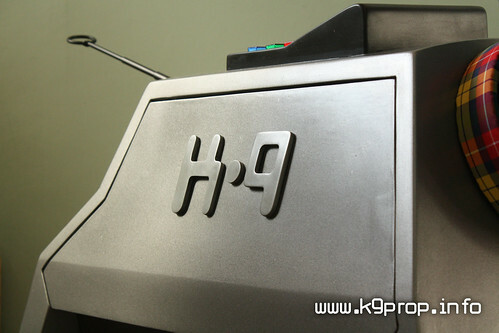 My K9 has only one handle like the early prop (I never liked the clutter of the extra two he had later). Ths handle is a custom made replica in steel reinforced cold cast aluminium, I can supply additional handles at extra cost if you feel you must have them! 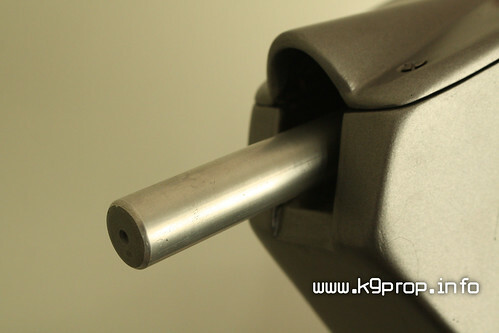 K9's nose gun is made in aluminium and moves smoothly back and forth along a guide with stops at both ends of it's travel. I agonised a long time about painting it black, but liked the aluminium look too much! Made in steel and brass the ears freely rotate and the stems are long enough within the head to add gears and mechanisms for future motorisation. Again, I agonised about painting the base of these ears red as seen in the early prop, but in the end I chose to keep them silver! Made from a three part aluminium tube terminating in a welded steel ring. 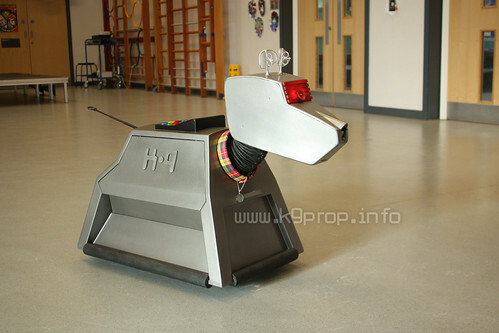 The tail enters the body through a custom moulded rubber grommit which bears the K9 logo. The tail is fully articulated, but not presently powered. 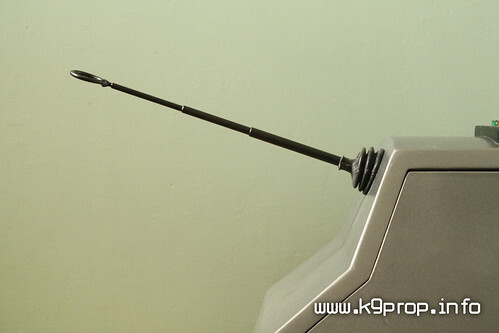 A custom cast 'sucker' is moulded directly to an extendable antenna fitted into the head. 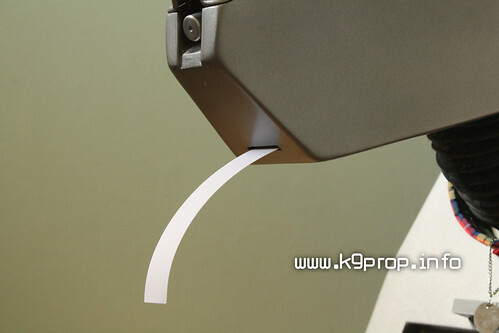 The sensor can be extended and retracted by hand. 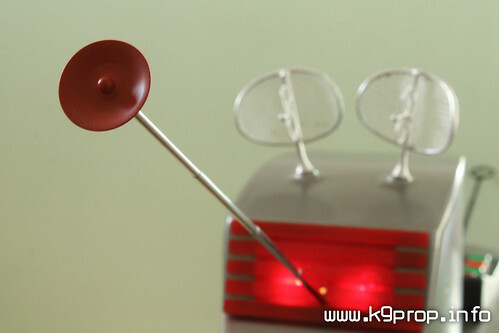 If K9's new owner would like me to mould a 'sensor sucker' to an electrically operated antenna at some point in the future, I would be happy to come to an arrangement. Accurately replicated and placed. 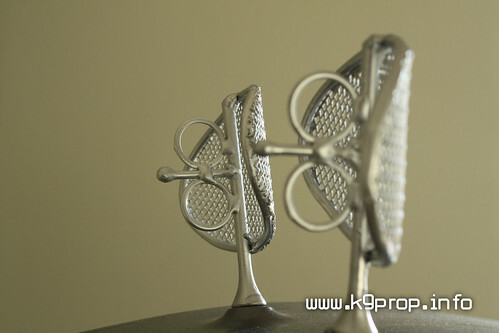 Polishable, made in cold cast aluminium. K9 has no inner workings at present, but there's plenty of space to fit some! 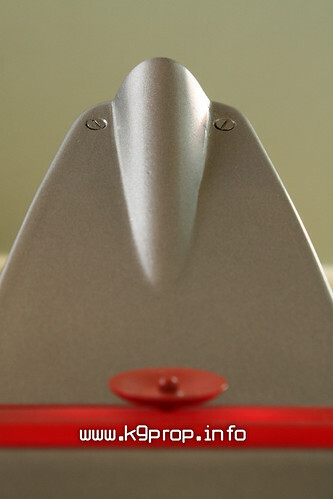 The head is attached by a aluminium rod pivoted on a fixed steel bracket. The VDU screen is made of clear perspex with a simple grey sheet of card giving colour to the screen from behind. I had always intended to fit a LED screen to the inside of the window giving a real display, but again, this would be in the hands of the new owner. 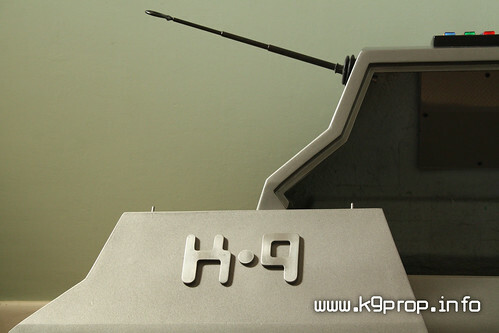 One of the trickiest parts of moulding this K9 was the creation of the rebate which allows the side panel to fit snugly and neatly into place. 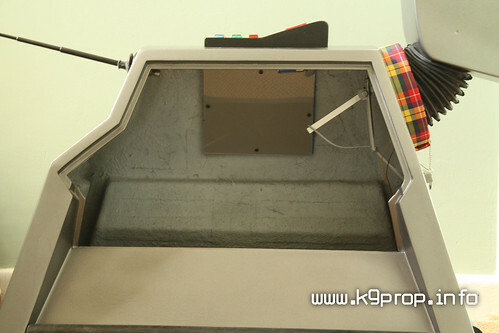 Many replica K9's do not have a removable side panel, and out of those that do, most don't build in a proper rebate leaving a gappy or floppy panel. I was determined not to use tumble dryer hose for K9's neck! I can't bear the look of a skinny neck on a K9, hopefully I got mine right :) The creation of this custom moulded rubber neck was the single most difficult part of this project but I feel that the final look was worth the effort. 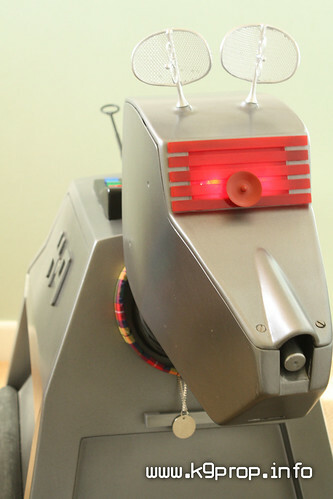 Two screws at the nose and one at the back of the head, and you can lift the lid of K9's head. This gives the ability to service bulbs. In the future, you could add workings to ears, sensor, nose gun, printer and speaker for voice. It's very rare to see a K9 for sale with an openable head! It took a lot of work to mould in flanges and guides and keep the look of the head right. 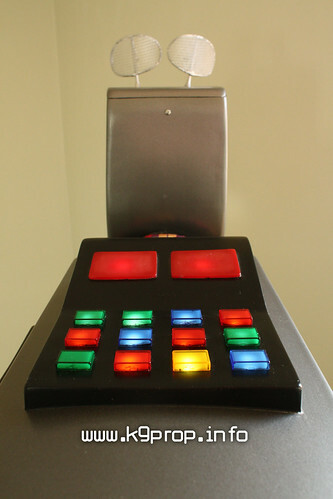 All 'buttons' are fixed and illuminated by ultra bright LEDs. When the panel is switched on, the two large red panels light constantly while the 'buttons' flash on and off in a random sequence. I hope that someone will love my K9 as much as I have. It'll be sad to see him go, but it's time for us to move on. 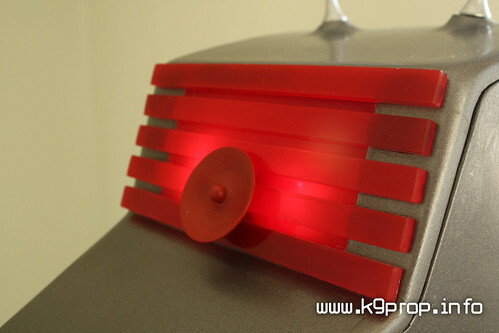 This is a fan site featuring a fan built prop replica created as a hobby. This is not an official product and I have no affiliation with the BBC. No images within this website should be copied or used elsewhere.